An estimated 500 homes have since been connected to the National grid after the mass commissioning of the last mile connectivity program by Cabinet Secretary for Energy Hon. Charles Keter in September 2018. 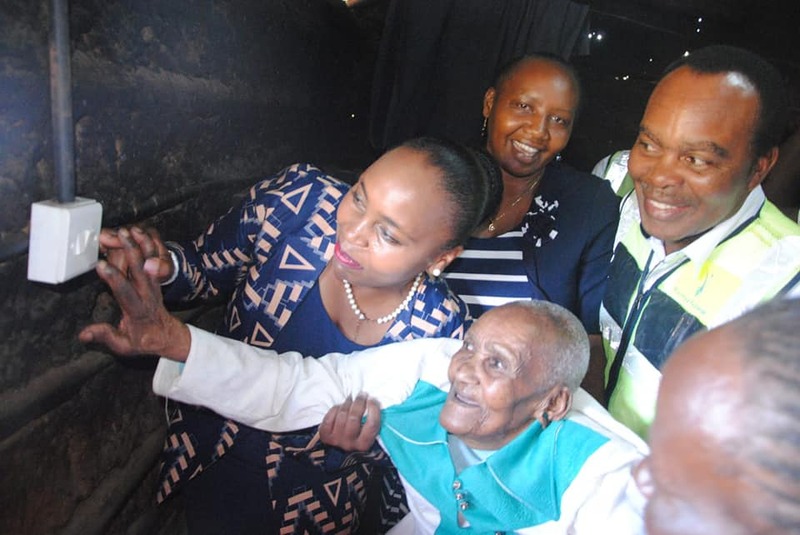 During an inspection tour, Deputy Governor H.E Caroline Karugu visited the home of Cūcū Ruth Gitiri Gichohi aged 121 years to commission connectivity of electricity in Gachika in Kiganjo/Mathari,Nyeri central sub- county on 6th November 2018. She was accompanied by area MCA Muthoni Kuruga, Regional KPLC Manager, Eng.Kenneth Chege and KPLC County Manager Eng. Barnabus Muli. The National Government under the guidance of the President H.E Uhuru Kenyatta plans to have 100% connectivity of electricity by 2020. Currently over 70% connectivity has already been done in Nyeri County. Electricity connectivity will spur economic growth as well as the social well-being of households and institutions around the area.